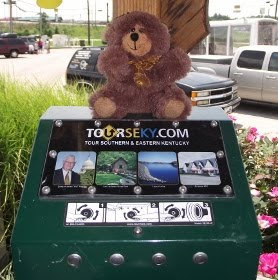 My daughter and I stopped by the London, Kentucky Tourism office on our road trip. The office is just off of I-75 at exit 41. The whole area is steeped in historic sites. The Daniel Boone National Forest offers all kinds of recreation opportunities. I wanted to learn more about our London, Kentucky road trip and the Tourism Commission was the perfect place to gather information. We were delighted to learn that we had already visited a couple of the historic sites on our road trip. The remote Camp Wildcat Civil War site near London, Kentucky is the site of the first Union victory in the Civil War. Trenches where the soldiers dug in are still visible. Another of our road trip stops near London, Kentucky is the Colonel Harland Sanders Cafe and Museum. If you're like me, you will recognize it as the Original Kentucky Fried Chicken. We also visited the nearby Cumberland Gap National Park. It isn't far from London, Kentucky and has a number of historic sites. Never mind that I am always up for a road trip on the Wilderness Road Scenic Byway. Speaking of outdoor recreation near London, Kentucky... The tourism folks suggested we visit Levi Jackson Wilderness Road State Park on our road trip. So, off we went. This wooded park contains seven buildings and a 136 site campground, hiking trails and lots of history. The museum contains all sorts of artifacts from pioneer days and is a pretty neat visit. We almost needed a U-haul to carry away the brochures that the London, Kentucky Tourism Commission gave us. We didn't make it any of the neat shopping areas or unique shops. It will take weeks to go back and discover it all! Fortunately, it's almost time for a summer road trip and the highway is calling my name.